I try to follow what is happening. (Certainly not through television.) It’s not easy, because so much is happening, on so many levels. Plus, I have a life to live, a job to do, friends to devote time to, problems to solve, a family to be a part of, a personal life to maintain, characters to breathe life to, one day. A bomb was planted in a busy shopping centre, on a Sunday, when shops were closed. A phone call was made to the police, police went in and found the bomb, no harm done. Afterwards, a very long statement was published, explaining the reasons behind the planting of the bomb in that particular place and at that particular time. For the most part, that statement made a lot of sense to me. A Senegalese illegal immigrant, chased by municipal police, jumped off a bridge and onto the rail tracks and died. A former colleague of mine who suffered from terminal cancer, requested that instead of wreathes, which is what people usually buy at funerals, people would contribute to a social medical centre in a southern suburb. With the collapse of our health system, a lot of people rely on these volunteer medical services for healthcare. The law that was recently passed in Parliament, which finally allowed children born to immigrants in Greece to be given the Greek nationality, much to the fascist party’s delight, was somehow declared ‘anti constitutional’. Four men, in their early twenties, were arrested after having robbed two banks and kidnapped a man. They had guns, but had used no force. Police beat them to a pulp while they were in custody and then digitally processed their photographs, so that their faces would be ‘recognizable’. The four men are self proclaimed anarchists and are strongly supported by their families. One of them was with Alexis Grigoropoulos, the 15-year old student who he was murdered by two police officers in 2008, when he was shot. 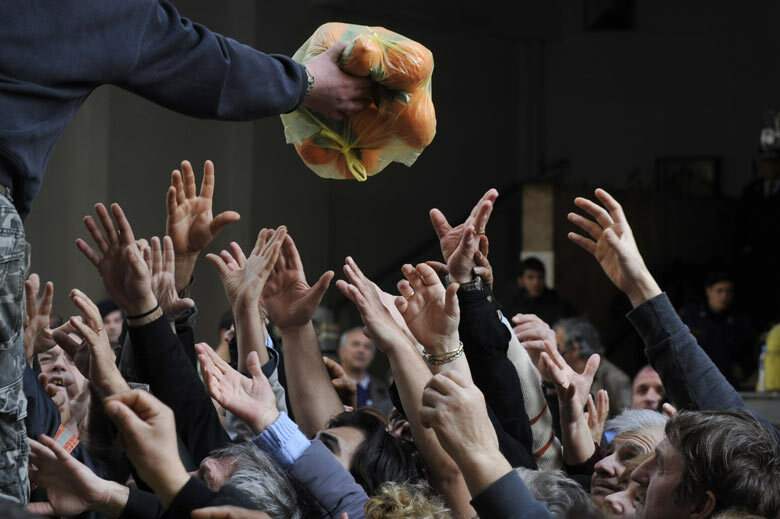 Greek farmers handed out their produce to a huge crowd of desperate citizens, as a form of demonstration. In the chaos caused by the crowd pushing to get to the free food, a man was injured. This is the photo that was published in The Guardian. How does this make you feel? Would I be as hot blooded if I was in my early twenties as those four men are? (Oh, can I call them boys? They look like boys.) I’m tempted to admit that I would, or I hope I would. So what has happened to me now? Is it just an age thing? Am I too old for this? (I don’t mean for robbing banks, I mean for actively attacking a system that I loathe, the darkness that is befalling our lives.) I keep reading comments like ‘it’s a shame that these young men felt they had to resort to violence to be heard’. ‘Violence does not solve anything’. Well, what does? Apathy? Writing a blog? Sharing articles on facebook? I was talking to my father about this and he seemed really sad. We had both recently seen a play, 'The Good Person of Szechwan', and were discussing the point where a character blatantly addressing the audience, urges them to revolt. That really excited me, but my dad was around during violent times in history, he has seen the country torn in two more than once and he’s lived long enough to have seen that it was all in vain. He is waiting patiently for this to pass. ‘We have money to pay the taxes, heat the house, live well, for another year’, he reassures me. It’s his way of trying to instill in me a sense of safety in these very unpredictable and hostile times. And I love him dearly for that. But even so, I can't stop hoping and yearning for a revolution. It's pretty obvious I won't be the one leading it. The twenty-year-olds will. But I swear, I will be right beside them. Because I haven't had my share of violent times and although my faith in almost everything I've ever believed in has had its blows, I am still young and I refuse to be disillusioned. Not just yet. Η Ιωάννα (εγώ) αγαπούσε από μικρή το γράψιμο και τον κινηματογράφο. Τρία πτυχία μετά, παραλίγο να μισήσει και τα δύο. Μετά από μια δεκαετία μακριά από πανεπιστήμια, πιστεύει ότι πλέον έχει βρει μια γλώσσα γραφής που δεν προδίδει το σκοτεινό ακαδημαϊκό παρελθόν της.